Use SkySafari 4, 5 or 6 to open the above-linked SkySet file (click image) to view the eclipse of the blue blood supermoon that will occur on January 31st. This file is set to view from Seattle, WA, but you can run your own simulation in SkySafari from anywhere you choose by adjusting the settings! On January 31, 2018, skywatchers in across much of the world will receive a post-holiday gift: the total lunar eclipse of a full supermoon that is also a Blue Moon! Unlike last summer’s Great American Total Solar Eclipse, lunar eclipses are completely safe to look at because the sun is below the horizon. Any sunlight that reaches the eclipsed moon has to pass over the Earth’s horizon, turning the moon reddish with sunset light - hence the nickname “blood moon” for eclipsed moons. Use SkySafari 4, 5 or 6 to open the below-linked SkySet file to view the eclipse of the Blue Blood Supermoon that will occur on January 31st. 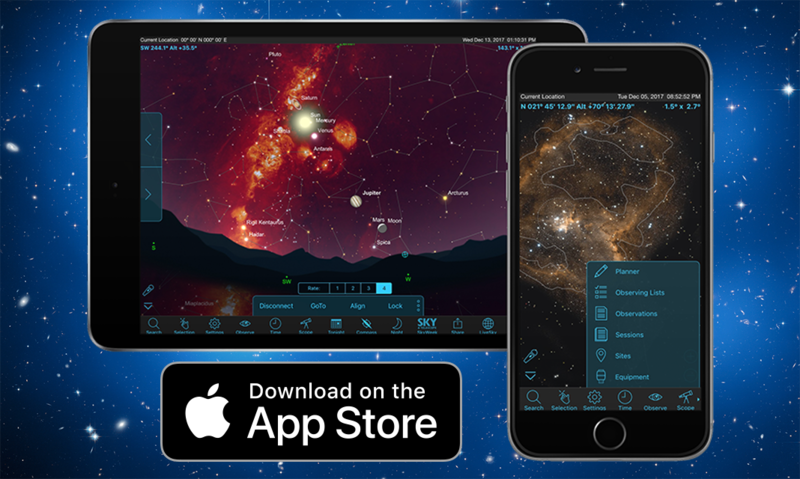 This file is set to view from Seattle, WA, but you can run your own simulation in SkySafari from anywhere you choose by adjusting the settings! This total lunar eclipse occurs only 1.2 days after perigee (the moon's closest approach to Earth), so the moon's diameter will appear about 7 percent larger than average, making it a "supermoon." The full moon will also be a Blue Moon — the second full moon to occur within the calendar month. Eclipsed supermoons aren't all that rare, but the total eclipse of a Blue Moon hasn't occurred since March 31, 1866. That's 152 years! Don't let the nickname mislead you, though — the moon won't look blue at all. The entire eclipse will be visible from northwestern North America, across the Pacific Ocean, and as far as eastern Siberia and Asia. Most of North America will see a portion of the eclipse before the moon sets and morning twilight arrives, while Eastern Europe and Central Asia will see the eclipse already in progress when the moon rises. During totality, when the moon is fully in shadow, the moon's northern limb will pass just south of the center of the Earth's shadow, darkening the moon's northern half more than its southern half. To find out whether the eclipse will be visible where you live and to preview what it will look like, use SkySafari 6. Open the app, and then search for and center the moon — don't worry if it's below the horizon for now. Next, set the app's date to Jan. 31, 2018, and the app's time to about 1 a.m. in your local time zone. 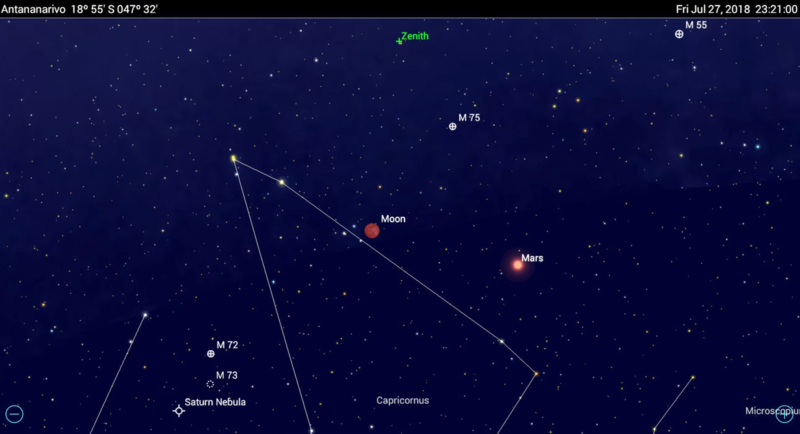 For locations in North America, the app will show the moon high in the night sky. Zoom in on the display until the moon shows as a good-sized disk. By running time forward, or by stepping hour by hour, you can watch the moon become eclipsed and then lighten again as it leaves the Earth's shadow. The moon's edge will start to darken at 6:48 a.m. EST (1148 GMT). Maximum eclipse occurs at 8:30 a.m. EST (1330 GMT), and the eclipse ends at 10:11 a.m. EST (1511 GMT). For skywatchers in the eastern United States, the moon will set before maximum eclipse, but you can see the entire eclipse by removing the horizon and turning off daylight using the app's settings. If you plan to view the actual eclipse, or photograph it, use your app to note the direction and how high above the horizon the moon will be during the event. That way, you can scout out a viewing spot where the moon will be visible throughout the eclipse duration. Sunlight shining on the solid globe of Earth casts a circular shadow, or umbra, into space. The shadow is always opposite the sun and near the ecliptic (yellow line), which defines the plane of Earth's orbit around the sun. The moon's orbit (gray line) is tilted 5 degrees away from the ecliptic. Whenever full moons occur close to the point in space where the moon's orbit and ecliptic intersect, a lunar eclipse can occur. While the moon is passing through the smaller white circle, only sunlight that has been reddened as it refracts over the Earth's horizon reaches it — painting it a blood red color. The larger circle, or penumbra, represents the region where some direct sunlight still reaches the moon. Even though the moon is relatively small compared with the size of Earth's shadow, the moon usually misses it. That shadow always lies near the ecliptic, which defines the plane of Earth's orbit around the sun. The moon's orbit is tilted about 5 degrees from the ecliptic. Lunar eclipses can occur only if the moon is full while it is near the point in space where the moon's orbit crosses the ecliptic. If you flow time forward, you can watch how, during this lunar eclipse, the moon's orbit carries it eastward through the penumbra and umbra, and out the opposite side. During partial lunar eclipses, the moon never fully enters the umbra. If you're observing from North America, you will not see any of this eclipse, but you can preview it on your app anytime and then watch the event livestreamed over the internet. The entire eclipse will be visible from Africa, the Middle East, India and western Australia. Observers in eastern Australia and Southeast Asia will see a portion of the eclipse before the moon sets and morning twilight arrives, while for Europe and eastern South America, the eclipse will be already in progress when the moon rises. The partial eclipse begins at 1824 GMT, the greatest eclipse is at 2022 GMT and the partial eclipse ends at 2219 GMT. To use your app, either hide the ground and turn off daylight, or change your app's location settings to somewhere the eclipse is visible. It's fun! 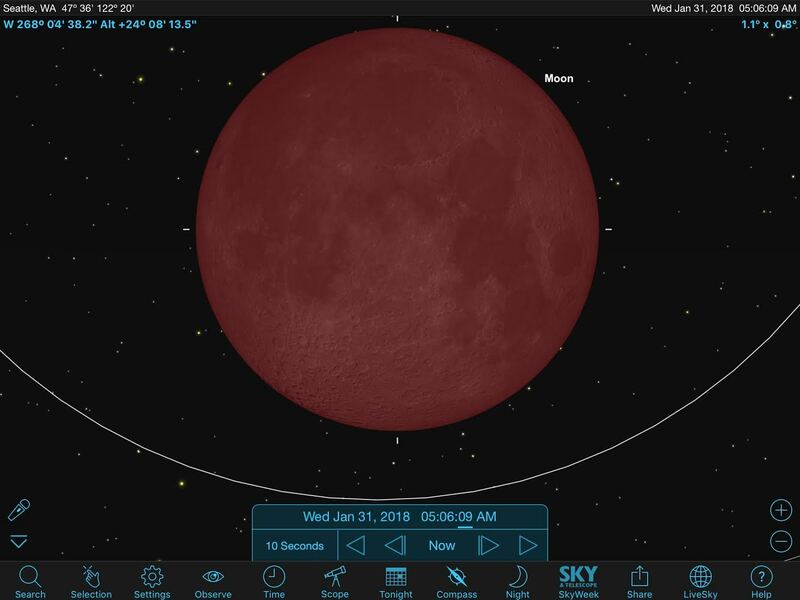 Using SkySafari 6 to preview lunar eclipses allows you to discover additional interesting aspects of the events. 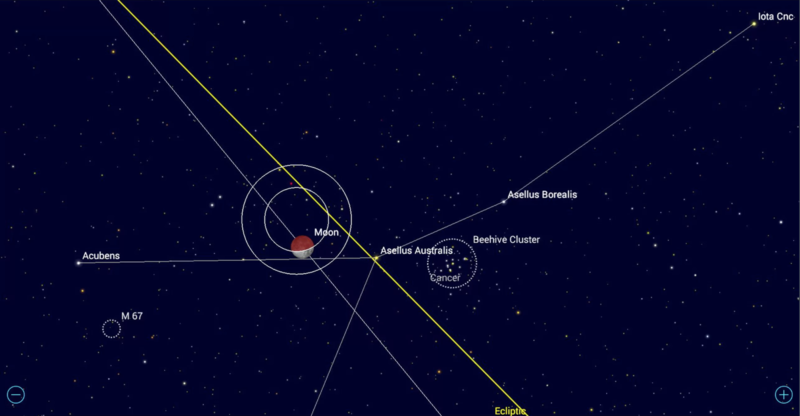 The total lunar eclipse of July 27, 2018 coincides with the opposition of Mars. The blood moon and the very bright Red Planet will make a wonderful sight and photo opportunity for observers where the eclipse is visible. When fully immersed in the Earth's shadow, the darkened full moon will also allow fainter deep sky objects to appear, such as the nearby Messier objects shown here. For skywatchers in Madagascar, the maximum eclipsed moon will be high in the sky, close to the Zenith (green cross). 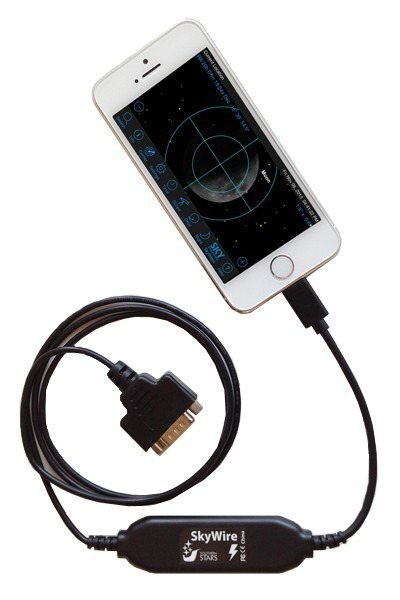 You can safely preview solar eclipses with mobile apps, too. This year's two partial solar eclipses occur on Feb. 15, July 13, and August 11. The first two are best visible from Antarctica, and the third one peaks over the North Pole, so using your app will be much less trouble! In future editions, we'll preview more 2018 highlights, including opportunities to see Mercury, the dance of Jupiter's moons and some possible naked-eye comets at year's end. We'll also cover how to measure stars' distances, and some whimsical asterisms — star groupings that are not constellations. Until then, keep looking up! Click below to download the SkySet file.